Welcome and Thank You for reading our posts. We appreciate your tips, engaging with us and liking our posts. It means a lot to us and we are working to bring all #WAwildfire news directly to you. Douglas Fire | CA | Brush Fire. Camp Pendleton. Near Golf Course on Camp Pendleton. Oceanside / MCP border. Unified Command MCIW Pendleton + Oceanside FD + Camp Pendleton FD. 50 acres. 60% contained. Mop-up operations in effect. Lookout Fire | WA | DNR. Dispatched 6/12/17 @ 1813 hours. 0.01 acres. In patrol status. Maeser Highway Fire | UT | NW area. UT DOF. 1 mile W of Vernal. 885 acres. 80% contained. Fire behavior is minimal with creeping and smoldering. Structures are under threat. 115 personnel. 2 crews. 6 engines. 1 helicopter. 1 structure lost. $750,000 CTD. Monument Fire | CA | Lincoln NF. Sacramento Ranger District. 8 miles SW of Weed. 4 miles E of Timberon, along the Sacramento Mtns. In remote area with limited access. 86 acres. 5% contained. Started 6/2/2017 @ 1545 hours from lightning. 30 personnel. Type 4 IC (Forest Service). North Fire | UT | Dixie NF. 9 miles NE of Central. 492 acres. 63% containment. Moderate fire behavior with torching, single tree torching and creeping. 189 personnel. 5 crews. 9 engines. 4 helicopters. $300,000 CTD. Oakwood Fire | CA | NE Madera. Madera County. 1450 acres. 85% contained. 50 personnel. 2 crews. 5 engines. Started 6/10/2017 @ 1319 hours. Unknown cause. Incident Cooperators are PG&E, USFS, CHP, Madera Sheriff’s Office, Fresno County Fire, Madera County Fire. Paige Creek Fire | AZ | Coronado NF. East side of Rhincon Mtns. 1,064 acres. 90% containment. 100 personnel. Started 6/7/2017 @ 1715 hours. Lightning caused. Pitka Fork Fire | AK || 60 miles E of McGrath. 16,746 acres. 43 personnel. Structure protection of Windy River and Sheep Creek. Ponderosa Fire | UT | Fishlake NF. Near Ponderosa Picnic Area. 9 miles E of Beaver. 21 acres. 0% containment. Unknown cause. Started 6/11/2017 @ 1800 hours. Fire behavior is active, short runs and some torching. Fire weather has been high winds with low RHs. Rice Fire | NM | Lincoln NF. Sacramento Ranger District. 3 miles NE of Sunspot off New Mexico Highway 6563 (Sunspot Highway). 1/4 acre. 0% contained. Lightning caused. 1 engine. 4 fire personnel. Start 6/12/2017 @ 1604 hours. Hazards trees and snags. Fire behavior minimal, creeping with 1-2″ lengths. 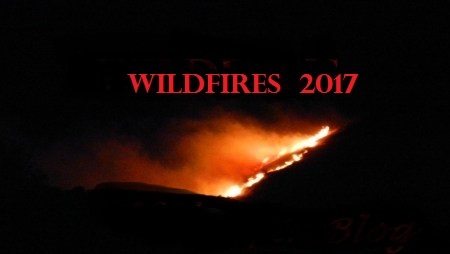 Continued with fire line 6/13/2017. Roland Fire | AZ | Coronado NF. Douglas Ranger District. 674 acres. 20% contained. Spruce Creek Fire | AK | 30 miles W of McGrath. 42 acres. 19 personnel. Straw Fire | NM | Gila NF. 35 miles NW of Mimbres. 152 ares. Minimal fire behavior with backing and creeping. Unknown cause. Tee Fire | AZ | 4 miles SE of Black Canyon City and N of Table Mesa. 659 acres. 50% contained. AZ DOF + Fire Mgmt. 100 personnel. Valley Fire | CA | Brush Fire. Temecula. Riverside County. Off of San Ignacio Rd X E Benton Rd. Unincorporated county area of Temecula. 33 acres. 100% contained. Start 6/13/2017 @ 1200 hours. 145 personnel. Resources: PD, AA, 2 copters, 2 dozers. FIU. 4 Air tankers. 4 crews. 3 water tenders. Cooperators: BLM, CAL Fire – Riverside, Riverside County FD, Riverside County Sheriff Office and USFS-San Bernardino.